HAILEY BRUNSON NEVER thought a theatre course would lead her to the White House. “It was so surreal,” the Rock Ridge High School senior says about meeting President Obama and the First Lady last year. “It was like a dream, being on the front lawn and shaking the president’s hand.” Brunson initially focused on sports growing up, but as a teenager she was diagnosed with a chronic illness that sidelined her athletic career. Wanting to stay involved at school led her to theatre and, ultimately, Anthony Cimino-Johnson’s dual-enrollment theatre course. The course, a partnership between Virginia’s Rock Ridge High School and Richard Bland College, a two-year junior college associated with the College of William and Mary, allows high school students to enroll simultaneously in two different academic programs and educational institutions. If successful, they obtain credit for their work from both schools, offering the opportunity to acquire college credit for work completed while still in high school. Although similar in rigor to International Baccalaureate or Advanced Placement courses, dual-enrollment classes don’t rely on standardized, national tests and materials. Instead, they hinge on a partnership between specific institutions. The schools collaborate on the goals, syllabus, and curriculum, and students receive credit by receiving an A, B, or C.
Located in Loudoun County, Rock Ridge High School is only three years old, serving about 1,700 students. The school’s dual-enrollment theatre class is the first of its kind in Virginia and one of very few dual-enrollment offerings in the arts, nationally. 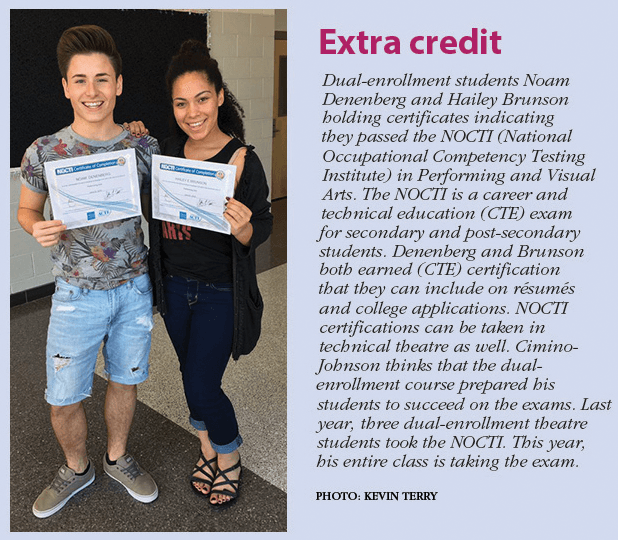 When considering dual-enrollment theatre, Duellman and Terry knew they already had the perfect resource in Cimino-Johnson, the school’s Thespian troupe director who had an M.A. from New York University in drama therapy, qualifying him to teach at the college level. 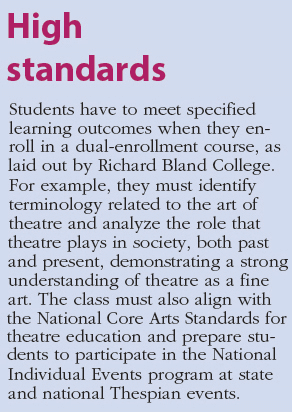 To get started, Cimino-Johnson worked with Richard Bland College faculty member Jill Mitten to establish learning goals and shape the course’s curriculum. He ultimately created a triple-threat course in theatre history, literature, and performance, hoping that the class could count for credit in theatre, humanities, or English. The current course is divided into two parts. The first covers classical theatre up through the mid-20th century. The second picks up where the first leaves off, bringing students all the way up to contemporary theatre. Each half is worth three college credits, and students can take both sections or just the first. The course requires a great deal of reading and script analysis, which is evaluated through writing and discussion, as well as production, performance, application, and design. 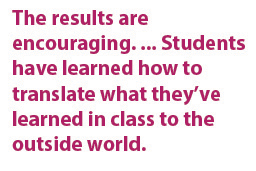 In 2015, the course’s inaugural year, 28 Rock Ridge students enrolled. The following year, 26 enrolled. The results are encouraging: 21 of 28 students received a superior rating for their work in Individual Events at Virginia’s 2015 state Thespian festival, proving that students have learned how to translate what they’ve learned in class to the outside world. Because Richard Bland College grants associate’s degrees designed to transfer to any four-year, post-secondary institution in Virginia, Rock Ridge students could potentially leave high school with a number of general education credits already under their belt — at no cost. While developing the dual-enrollment program, Rock Ridge and Richard Bland prioritized making their offerings completely free to students. To do this, the college is using money received from the state to offset the cost of tuition. “The hope is to be able to offer this, as it grows, anywhere in the country,” Cimino-Johnson says. 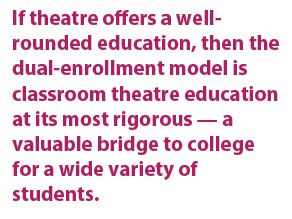 Theatre is especially well-suited to preparing students for life after high school, in college, and beyond. “There are so many components of theatre education,” Cimino-Johnson says, “from sitting around the design table [talking] about a production, to executing those designs, to having them fully realized, to managing budgets, and teaching them how to create résumés.” He also enriched his dual-enrollment course with master classes in stage fighting, voice, and movement taught by college faculty in and around Virginia. These classes go a long way to demystify college options, college work, and even the professional world. 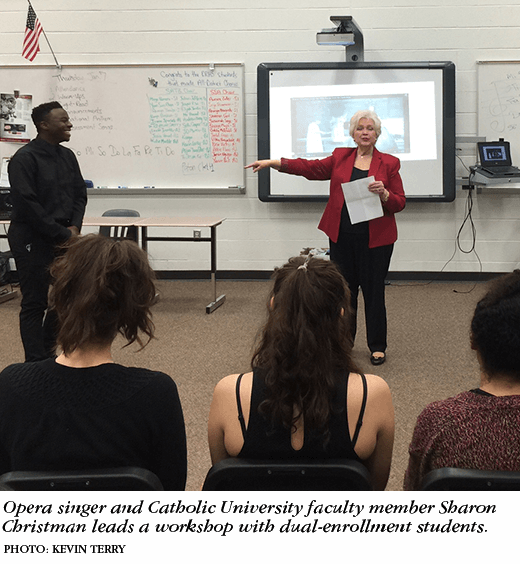 During her visit to Rock Ridge, opera singer and Catholic University of America faculty member Sharon Christman talked with students about how many people it takes to make theatre work, including those whom students may not have considered, such as makeup artists and business managers. 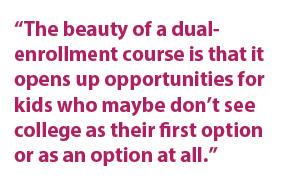 And that’s the point of the dual-enrollment program: to open students’ eyes to different possibilities. Both Cimino-Johnson and Terry hope that dual-enrollment theatre catches on nationwide. “I would love to start a national conversation with theatre teachers and help provide that language and see what support we can start to gain from other states, because there’s got to be other states on board that would love to offer this opportunity,” Cimino-Johnson says. For him, it’s great to give kids a break on college tuition, but the real value of strong theatre education is about transforming young lives, creating future leaders, parents, citizens, and professionals. That performance aspect led to a collaboration of sorts last year with Canadian high school Walkerville Collegiate Institute, which had heard about Rock Ridge’s production of Ernest and the Pale Moon. Students from both schools conducted Skype discussions on the challenges of performing the play, how to stage certain scenes, and how they might work together in the future. 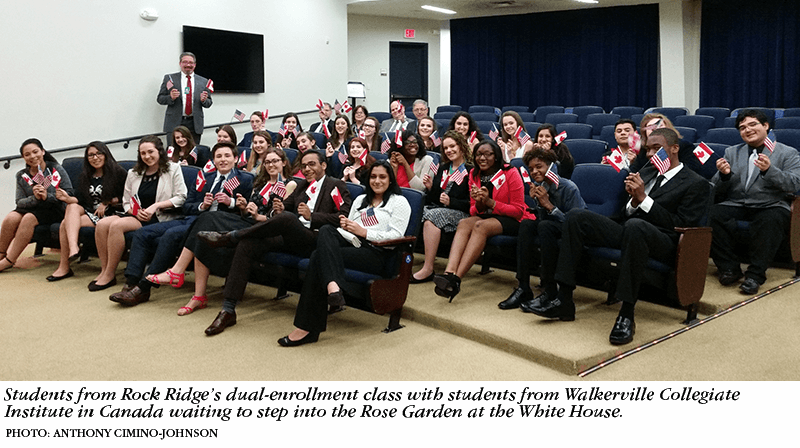 Their partnership and the course’s innovative theatre format caught the attention of the White House, and First Lady Michelle Obama invited the groups to participate in a special ceremony in the Rose Garden honoring educational partnerships between American and Canadian schools.